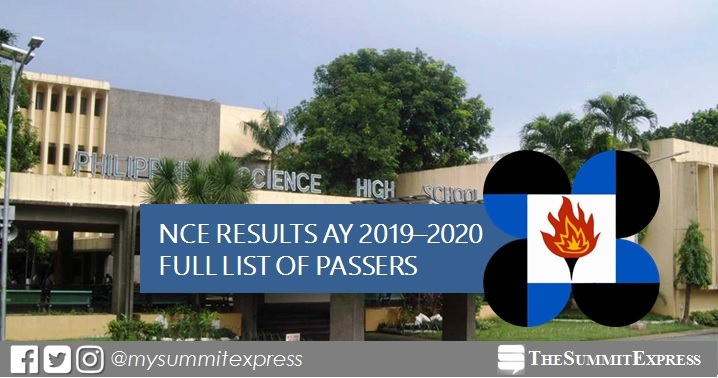 MANILA, Philippines – The Philippine Science High School System (PSHS) officially released on Tuesday, December 18, 2018, the complete results to include the full list of passers of the October 2018 National Competitive Examination (NCE) for academic year AY 2019-2020. Congratulations to all the passers of 2018 NCE! The examination was conducted on October 20, 2018 in more than 100 testing centers nationwide. Hon. FORTUNATO DELA PEÑA, Secretary of the Department of Science and Technology and Chair of the PSHS System Board of Trustees, announces the names of the successful qualifiers to the Philippine Science High School System (PSHSS) Search for Scholars for 2019. Of the 32,651 applicants, 1,470* (4.50%) examinees successfully hurdled the one-step screening administered on October 2018. NOTE: Due to Data Privary Act, there are 43 principal qualifiers who signified NOT to announce their name publicly. They will receive an email and call from the campus where they are qualified to enroll. 'Pisay' advised the qualifiers to IMMEDIATELY contact the Registrar or the Campus Director of the PSHS Campus they are qualified to enroll, or visit www.pshs.edu.ph or www.dost.gov.ph for more information on early enrolment. Deadline for slot confirmation/ reservation of principal qualifiers is on January 31, 2019 for Main Campus qualifiers, and on February 18, 2019 for regional campus qualifiers. Specific schedule of other enrolment activities shall be announced by the respective campuses. Alternate Qualifiers will be called starting February 19, 2019.